It’s easy to look at the Vitamix website and wonder how you’re supposed to know what the Vitamix model differences are, let alone which model is best suited for your needs. It’s actually substantially less confusing than it looks at first glance, and I’ve put this post together to help walk people through the main differences. There are two main options, which I’ll describe as the older, tried and true model, and the newer, quieter and slightly more powerful model. Vitamix started selling the Professional Series 300 in 2012 and has since released several other blenders models based on that motor base. All of the other Vitamix models are a variation of the 5200 model. I prefer the newer model, but as made clear in my first blog post comparing the two blenders, the new models are still loud. My Blendtec is also very loud. The press release for the Pro 300 claims the new model is 10 decibels quieter than it’s predecessor, but high end blenders are very loud, so know that the new models are quieter, but not quiet. The newer models also use a variable dial from speeds 1-10 for all speeds, while the older models have a variable dial from 1-10, and then a switch that puts the blender in high gear, equivalent to what you get by simply dialing up to 10 on the newer models. The newer model does have a shorter, wider jar, which has the negative side effect of not being as well suited to smaller mixes as the older models, but the upside is that the newer model handles large, thicker mixes, like peanut butter, better than the older model. I have had the 5200 turn off automatically under strenuous mixes, while those same mixes have never given me a problem with the 7500 or Professional Series 300. The newer model does fit under my cabinets, while the older model did not, but I never had a problem with my 5200 living on my kitchen counter due to it’s height. Obviously the price depends on exactly what model you are looking at, but the older models tend to be less expensive. 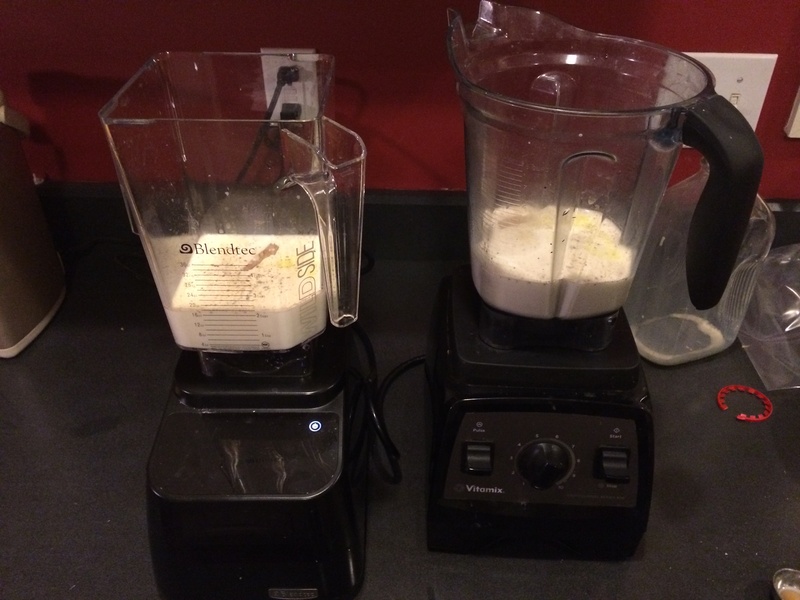 Two Speed , Standard and Standard Program Blenders are the category names Vitamix uses when selling their factory refurbished models . The names are very fitting, and describe what you’d likely expect. Two Speed: The Two Speed forgoes the variable dial completely, having simply a low and high speed. Two speed models include the TurboBlend Two Speed and the CIA Creations. Standard: The Standard models have the variable speed dial as well as the high speed switch. Standard models include the 5200 , CIA Professional Series, Creations II, Creations GC, Professional Series 200, Total Nutrition Center and TurboBlend VS.
Standard Programs: Identical to the Standard, except the speed dial includes three pre-programmed settings for smoothies, hot soups, and frozen desserts. Models include the 6300 and Professional Series 500. Next Generation and Next Generation Programs are the category names Vitamix uses for the newer models. , Professional Series 300 and Creations Elite. Next Generation Programs: While the Standard Programs models include only three pre-programmed settings, the Professional Series 750 includes five presets: Smoothie, frozen dessert, soup, purée and wash cycle. Currently, the only model sold with these programs is the Professional Series 750 . Unless you only need a Two Speed model, or really, really want a blender with preset cycles, you should probably be looking at one of the standard versions of the older or newer Vitamix blenders. I also own a Blendtec Designer Series blender, which is better designed for presets, offering six different cycles, and a large, bright display that counts down how much time is left in the cycle it is using. Even with the Blendtec, I am not a big fan of presets, and have found that only the soup setting works well consistently. I definitely prefer my Vitamix to my Blendtec, and I would rather use the Vitamix with manual controls, using the tamper when it helps, than use pre-programmed settings. I know which of the five choices I am interested in, now what? Once you’ve identified which of the five options above is most suitable for you, you just need to identify which model you’d like to order. Note that the difference between models in the same category are limited to things like the face plate and accompanying cookbook. I had both a 7500 and Pro 300 for a brief period of time, and I wrote a blog post, with photos, showing the similarity and differences between the two blenders. If you are concerned about what cookbook your blender comes with or whether your blender has a stainless steel faceplate, then you’ll need to look at all the models for that category to find the one that is the best match for you. However, if you’re most interested in which blender offers the best bang for your buck, I have identified the best priced blender for each of the five categories. The best priced option, which I list below for each of the five variations, includes Vitamix’s standard 7 year warranty, with the exception of the Two Speed, where all models offered have a five year warranty. If you want to save a bit of money, Vitamix offers a refurbished version of each of the five options, which includes a five year warranty. The warranty experience is phenomenal regardless of whether it is the five year or seven year. I have had very good warranty experiences, and received the same stellar support with my refurbished Creations II, my first Vitamix, that I did with the 7500 I purchased new. the most affordable way to buy a Vitamix, and usually means Vitamix.com is the best price on new models as well. 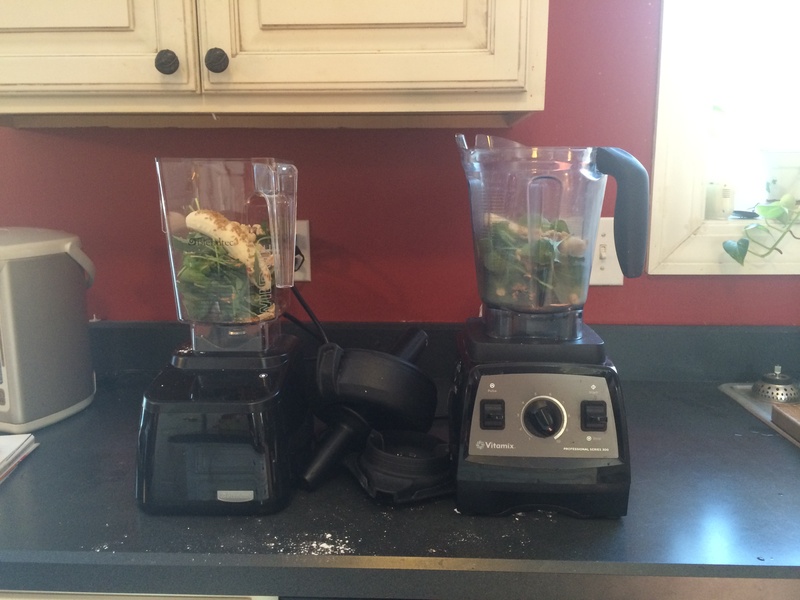 I’ve written in the past about why I would spend so much money on a Vitamix blender. Hopefully, with those post, I’ve helped make sure that anyone else who is buying one can do so knowing they’re buying the right Vitamix blender for their needs. Edit: Since writing this post, Vitamix has improved their website and naming to refer to the new models as Next Generation blenders and the older models as Classic model. I’ve updated this post to reflect that nomenclature. I’ve also written a helpful post on what blender containers are available for each blender. 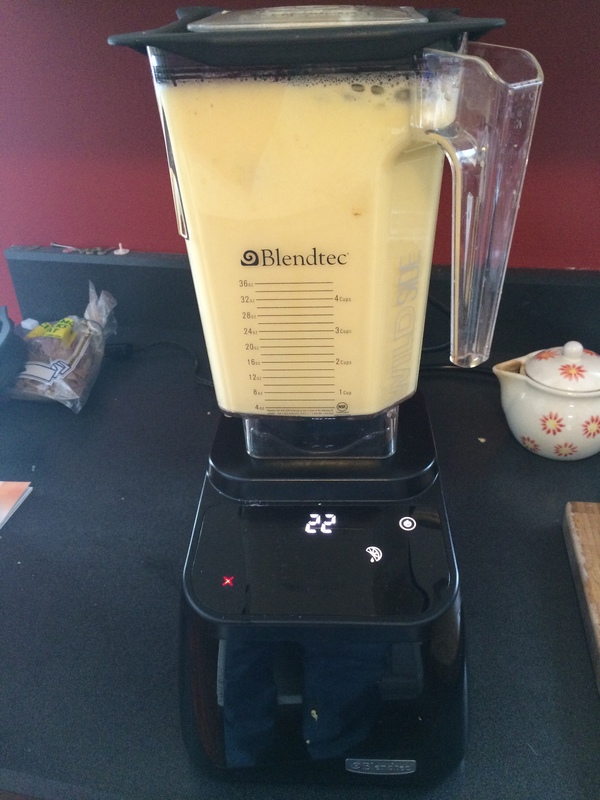 Yesterday will probably be the most blender usage my blenders see in a single day in 2014. Less than two weeks ago, I received a Blendtec Designer Series blender, and while I took photos for a physical comparison of the new Blendtec and my Vitamix Professional Series 300 . (The Pro 300 is basically the same as a 7500 , a good explanation of the different models is here.) I was really looking forward to actually seeing how they performed side-by-side. We invited a family we are close friends with over for breakfast, and they stayed for lunch as well. They knew I was excited about trying out my new blender, and I told them to bring over whatever they wanted to blend up in the blender, and that breakfast would be green smoothies and waffles. The first thing I made was Whipped Cream, which I made in the Blendtec because of the Twister Jar, which was very well suited for the task. The Blendtec does this better than the Vitamix. After that, I made the first green smoothies of the day, Baby Kale, Peanut and Banana Green Smoothies, which I made in both blenders simultaneously. 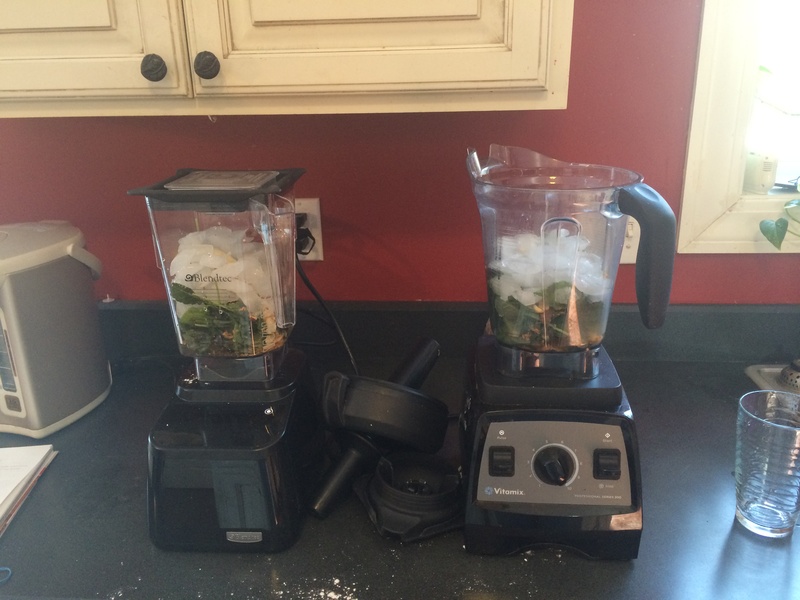 The Vitamix edged out the Blendtec with better texture and less heating during blending. After the frozen fruit smoothie experiment, I decided to make my Homemade Frozen Mocha Drink for them, but my ice cube tray broke recently, so I had a giant frozen chunk of coffee, which gave both the Blendtec and the Vitamix difficulties, though the tamper and time were eventually enough to get the frozen coffee into the blades instead of bouncing on top of them. I left out the stevia, which made it less sweet than normal, since getting back from Japan, I’m on a bit of a bitter is good kick, so I enjoyed it better that way, and my friends both seemed to enjoy the drink a lot. For lunch, my wife threw together a tomato and cream sauce for some pasta that helped some of the baby kale we’d bought. 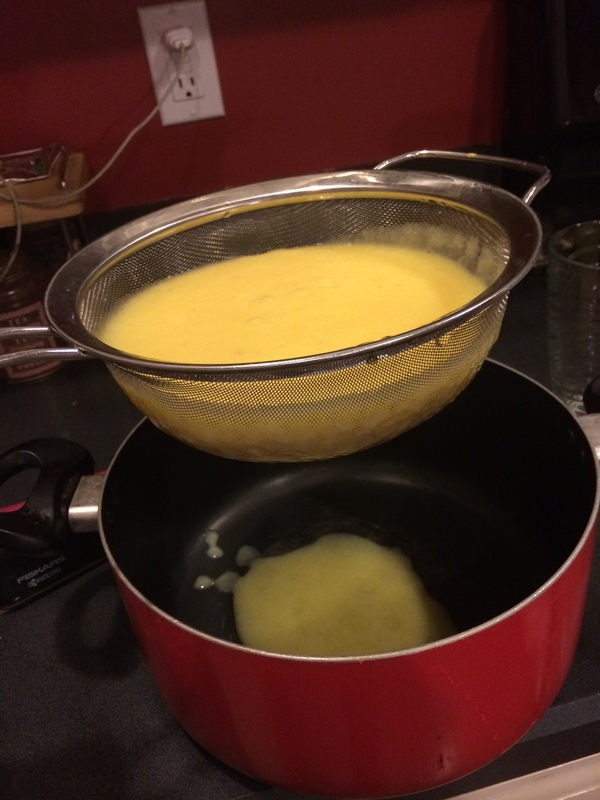 I decided to make some Powdered Parmesan, which I used the Vitamix for, as I know it excels there, while my experience with the Blendtec was not as good. As a drink, I made a Mild Baby Kale Green Smoothie to go with lunch that was excellent, but as that was the green smoothie equivalent of throwing all your leftovers into a pot and finding out they make amazing soup, I don’t think I’ll ever be able to replicate that drink, even though it was the best kale based green smoothie I have had to date. As my friend was leaving he realized that he left a four pound bag of juicing oranges in our kitchen, and told us to put them to good use, as he bought them specifically to try blending them. My wife and I did peel and blend them, but I can’t say that qualifies as good use. After having made Fresh Oranges Applesauce, I now understand why freshly blended oranges are not a thing. 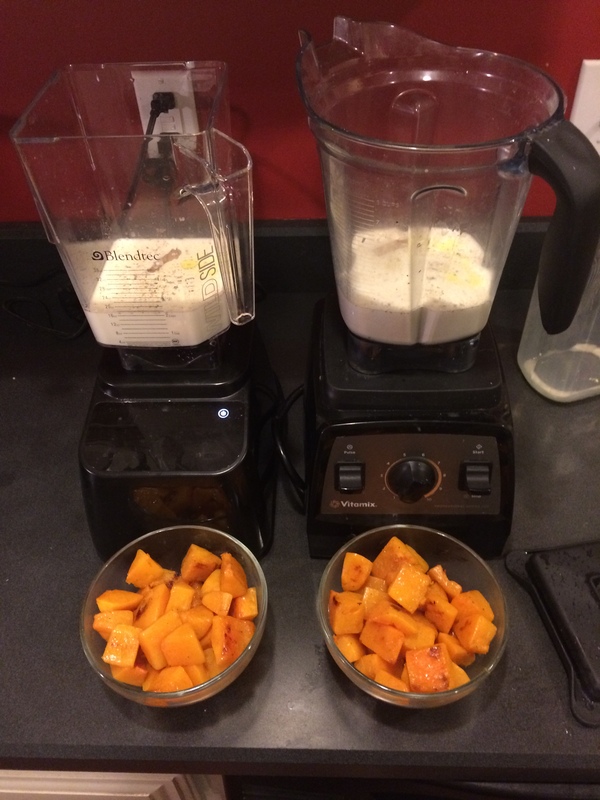 To wrap up the day, and to make a relatively easy dinner, I made Butternut Squash Soup for dinner, making reasonable sized batches in both blenders simultaneously, instead of cramming everything it the Pro 300 like I normally do. 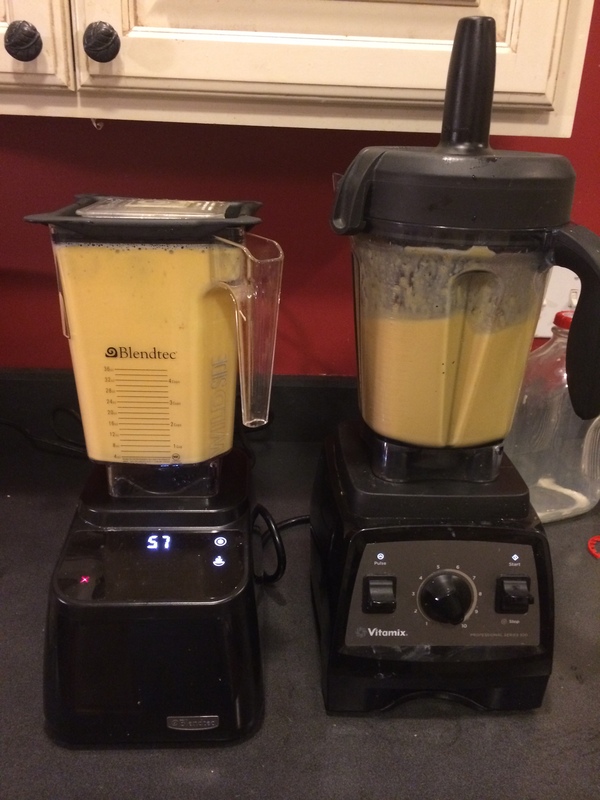 To help heat the soup up, I did mix both batches in a Blendtec for one soup cycle, but as you can read in that post, the smell the blender gave off is making me think twice about trying that again. So that’s it. Not a bad Saturday of blending. What do I think about the Blendtec? I’m definitely still learning. I don’t like when water comes out of the lid during a cleaning cycle, hits the LCD panel, and stops the cleaning cycle I was running it through, nor am I thrilled at the smell when running a very large patch of soup through a second soup cycle in a short period of time. But those can be chalked up to user error or misuse. I’ve written before about why I love Vitamix, and why I would spend so much money on a Vitamix blender, and I can’t say I’m there yet for the Blendtec, but I can already see a few things it does better, such as whipped cream or heating soup while blending. For the budget minded, you can get a Factory Re-certified Blendtec Total Blender Classic Series for $20 less than a Vitamix Certified Reconditioned Standard , which is basically the 5200 model, and the warranty for the Blendtec is 7 years, while the warranty for the Vitamix is 5 years. (Note that you can get a $0.00 shipping option through the Blendtec link above, and the Vitamix link includes provides free shipping, both of which are the cheapest ways to get a Blendtec or Vitamix with a 5+ year warranty.) At that price, I can see the slightly cheaper, includes a longer warranty, fits better under a cabinet and includes programs arguments adding up to a compelling reason to consider the Blendtec option very strongly. For me, it’s been years since I purchased my refurbished 5200, and I’ve already come to terms with the fact that I use my blender enough to justify buying the blender I want the most. Which, as of today, is the 7500 model. (Also sold as the Professional Series 300 and Creations Elite) That said, the Blendtec is still very new to me, and I plan to continue to use it again and again, in hopes of having a much better understanding of its strengths and weakness, as well as the strengths and weaknesses of my Vitamix. I’ll probably post another evaluation of each in a few months as pricing, and my understanding of each blender, changes. Anything I should know about the Blendtec Designer Series? Anything you’d like me to blend? Let me know in the comments! One of the things that they brought was a four pound bag of Florida oranges that was being sold at the local supermarket as “Juicing Oranges”. They’d picked up the oranges, thinking they might be good for mixing in the blender, but we didn’t blend them while they were over, and they ended up leaving them with us. I figured, why not try to blend them? Whole Juice is one of the six pre-programmed cycles on the Blendtec Designer Series, so I figured I’d use the Blendtec to make this. Not something I’d recommend as a good use of oranges, putting a bunch of oranges in any blender and expecting good orange juice is a bad idea. Peel the oranges and remove as much of the pith as possible, as well as the seeds. Put all the fruit in the blender and use the Whole Juice cycle (50 seconds) to blend everything. I don’t know what I was expecting… Maybe really, really pulpy orange juice? Maybe really thick juice that would separate after a few hours in the fridge? No, what I got can be reasonably accurately described as applesauce, made with oranges instead of apples. Our first impression was that it wasn’t bad. We assumed the juice would settle, but even several hours in the fridge caused no change in texture. I put the mixture in a strainer as a last ditch attempt to save it, but ended up throwing almost all of it away. So if anyone else was wondering why there aren’t recipes online for making orange juice in a Vitamix or Blendtec, now you know why! While we made a reasonably good green smoothie in the morning, I was shocked by how good the green smoothie I made for lunch was. Unfortunately, I can’t ever replicate it, at least not exactly, because the fruit portion of the green smoothie was the left over fruit from that morning. Added everything together and used the tamper on speed 10 on the Vitamix Pro 300. Blended for approximately 40 seconds. I don’t know how accurate that is, but the veggies are correct, and the fruit was mainly blueberries, but the small amount of mango really helped. I was shocked by this because I was just using the leftovers we had, and I’m not usually a fan of kale or blueberries, but this particular mix was something I would definitely make again. The first thing I made was whipped cream for the waffles. Following that, I decided to make a green smoothie using baby kale, based on a recipe I received from a co-worker. I am not a fan of kale, but I wanted to change that. My coworker makes this green smoothie regularly in a Health Master her husband received as a gift using extra water and peanut butter and cinnamon powder instead of peanuts and cinnamon sticks, and leaving out the flax seeds. The ingredients go well together, and the results is one of the most drinkable kale based green smoothies I have had. I do not have a high degree of confidence in the ratios of the ingredients below, but the ingredients themselves work well together. 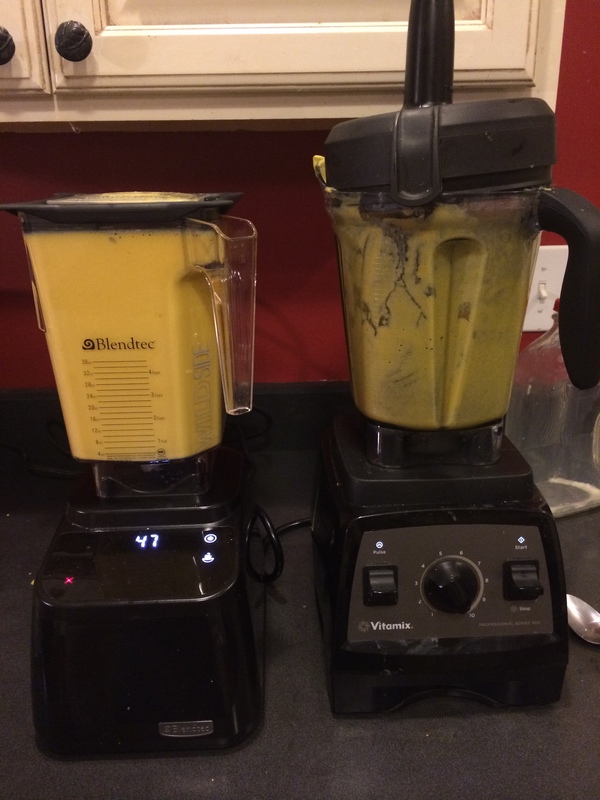 I used the smoothie button on the Blendtec, and used the tamper on speed 10 on the Vitamix Pro 300. I started the Vitamix just after the Blendtec, turning it off just before the 40 second smoothie program ended. The smoothie itself was a little better than I was expecting, but not as interesting to me as how the Blendtec would compare to the Vitamix. I broke out both the two “B” and two “V” cups that I made for blind taste testing the Banana Milk I made in my first side-by-side test of the two blenders, and served the green smoothie to my guests, and got two votes for the Vitamix with texture the only reason that either friend could articulate. I noticed that the Blendtec mix was slightly warmer, which is a trend I’m seeing, an issue that could be easily rectified in this recipe by using more ice and less water. Regardless, the difference between the blenders for this particular mix is small.